The Okinawa Booth in the 16th China International Fair for Investment and Trade, held at the Xiamen International Exhibition Center in Xiamen City, Fujian Province from September 8 to 11. Fourteen Okinawan companies and organizations took part in the 16th China International Fair for Investment and Trade held in Xiamen, Fujian, from September 8 to 11. According to the Okinawa Industrial Promotion Public Corporation, the deals organized by the companies during the four days will be worth a total of about 120 million yen. During the fair, they had 428 opportunities to carry out sales talks and entered into 20 contracts with 184 contracts to be sealed within a year. There were 102 applicants seeking to work as agents for the Okinawan companies. The Okinawa Industrial Promotion Public Corporation, which served as the executive office for the Okinawan business meetings carried out a survey. 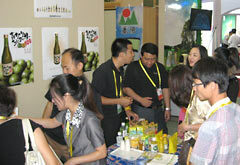 Neo-Planning and STTA Planning of Naha, Chang Taiyang Agriculture of Fujian, and Okinawa Tokusan Hanbai of Tomigusuku, have attracted many business inquiries, including prospective future buyers. Neo-Planning presented products such as sheets and a negative ion mattress. STTA Planning put designs and interior décor on exhibition. Changle Tai yang Agriculture Co. LTD displayed a Japanese-style model room using shoji screens and tatami. Okinawa Tokusan Hanbai arranged for sale of Okinawa specialty foods such as vegetable chips, shikwasa beverage, brown sugar and ginger powder. There were many inquiries from the visitors, including the exchange of information.